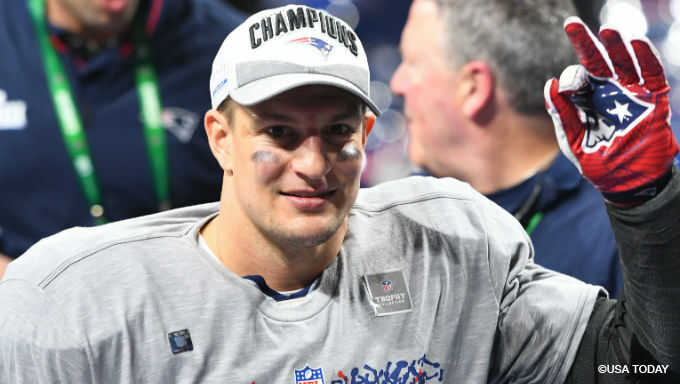 The NFL offseason continues to dominate the headlines as Rob Gronkowski of the New England Patriots has retired. Gronkowski announced his retirement on Sunday evening via his Instagram account, hanging up his cleats after nine seasons in the NFL. Gronkowski will leave the game on top, winning the Super Bowl in his final game and likely going down as the most dominant tight end in NFL history. He was a four-time All-Pro selection as he caught 79 touchdowns in 115 career games. He was a dynamic weapon as he averaged over 15 yards per reception and was one of the best blocking tight ends in the league. There was nothing on the field that Gronkowski couldn't do at an elite level. He should be a shoo-in to make the Hall of Fame when his time comes. It all started at 20 years old on stage at the NFL draft when my dream came true, and now here I am about to turn 30 in a few months with a decision I feel is the biggest of my life so far. I will be retiring from the game of football today. I am so grateful for the opportunity that Mr. Kraft and Coach Belichick gave to me when drafting my silliness in 2010. My life experiences over the last 9 years have been amazing both on and off the field. The people I have meet, the relationships I have built, the championships I have been apart of, I just want to thank the whole New England Patriots organization for every opportunity I have been giving and learning the greatvalues of life that I can apply to mine. Thank you to all of Pats Nation around the world for the incredible support since I have been apart of this 1st class organization. Thank you for everyone accepting who I am and the dedication I have put into my work to be the best player I could be. But now its time to move forward and move forward with a big smile knowing that the New England Patriots Organization, Pats Nation, and all my fans will be truly a big part of my heart for restof my life. It was truly an incredible honor to play for such a great established organization and able to come in to continue and contribute to keep building success. To all my current and past teammates, thank you for making each team every year special to be apart of. I will truly miss you guys. Cheers to all who have been part of this journey, cheers to the past for the incredible memories, and a HUGE cheers to the uncertain of whats next. On the surface, it would appear that the loss of Gronkowski for the Patriots would be damaging to their Super Bowl odds for next season. But at 888Sport, their odds have not changed (+750) after the announcement as they remain tied for the highest Super Bowl odds with the Kansas City Chiefs. Fans of NFL betting might wonder how could the odds not change despite Gronkowski retiring. There are a few things that explain why the odds haven't shifted. The first is merely the greatness of Bill Belichick. Players come and go, and the machine that is the New England Patriots rolls on. Belichick will enviably find a way to have the Patriots be successful on offense, even without Tom Brady's favorite weapon. Players such as Randy Moss, Wes Welker, and Brandin Cooks have all departed from New England, and the team has found a way to stay on top. They truly embody the philosophy of "next man up." Expect the Patriots to use some other formation or innovation that will allow them to dominate the rest of the league. It's just what Belichick and Brady do. The second reason is that New England is loaded with draft capital in one of the deepest tight-end drafts in recent memory. The Patriots hold six picks inside of the top three rounds and have enough draft ammunition to move around to get a potential replacement for Gronkowski. Don't be shocked if the Patriots target Iowa's Noah Fant or T.J. Hockenson in the first-round to replace the future Hall of Fame tight end. They have the draft picks to improve their roster in April dramatically. The final reason the Patriots' odds haven't dropped is that there is a chance that Gronkowski isn't actually done playing football. According to his agent Drew Rosenhaus, there is a chance that he could return at some point in 2019 if Brady or the Patriots needed his services. Would it be all that surprising if Gronkowski took the first few months of the season off and returned for a playoff run? Not at all, especially when you consider the beating that his body has taken over the last decade. If Gronkowski could skip training camp and the first half of the season, he would be fresh for the home-stretch, provided New England is still in contention (they will be). Don't be surprised if we hear rumblings about "Gronk" returning as the season inches closer. No matter what happens this offseason, the Patriots are going to continue to be the team to beat in the AFC. They have the greatest head coach and quarterback of all time, and that isn't changing anytime soon. Despite the retirement announcement from Gronkowski, the Patriots should still be the favorites to win the Super Bowl in 2019. Which Players in 2019 NFL Draft Could Most Impact Betting?